Discuss emerging trends in windows and doors. Identify the types of multi-panel door systems available and their most appropriate applications. Explain what performance testing and certifications are for windows and doors, and how they measure product performance. Describe the types of component improvements and innovations that enhance contemporary design, while also enabling greater energy efficiency and performance. Contemporary craftsman. American farmhouse. Modern shed. The box home. Contemporary design is radically shifting the look of America’s homes. Windows and doors play a leading role in contemporary design. A stamp of the movement is to increase both the amount and the size of windows and doors on the facade. Glass is maximized, and frames, stiles, and rails are kept crisp and minimal. 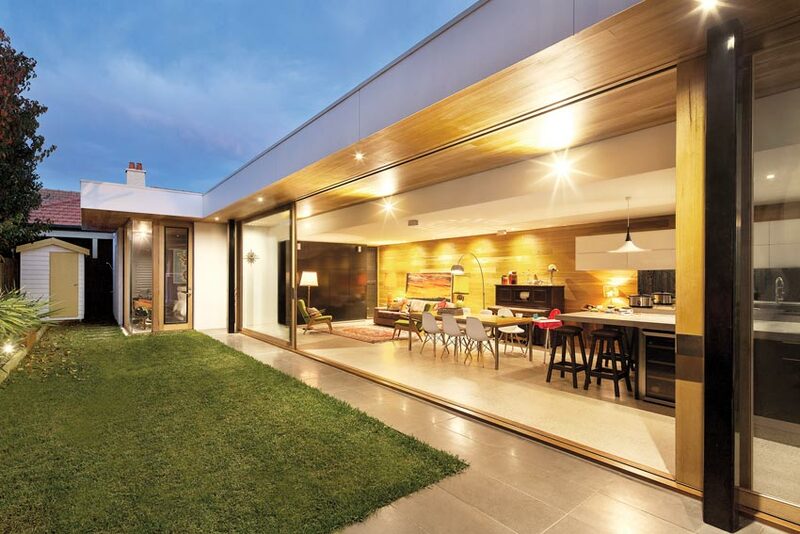 Doors, in particular, receive specific attention, as walls are supplanted with multi-panel door systems, eliminating the barrier between indoors and out. Contemporary design has assigned a much more prominent role to doors and windows in the home. In partnership with this focal aesthetic role, advancements in multi-panel door systems and component technology allow contemporary design to achieve energy-efficiency goals, performance, and service life, creating a project that transcends trends. A key shift is underway in architectural home design and style. The rise of contemporary design in homes draws from the pages of known historical styles, preserving the essentials of the original movement while updating these elements with clean lines and modern materials. A modern or contemporary craftsman home will still employ low-pitched roof lines, decorative brackets, an extended front porch, and 4-over-1 or 6-over-1 double hung windows, but these elements will be modernized with simple lines and thin stiles and rails at the windows. Simulated divided lights are present, but with thin, simple grids. In an American farmhouse, traditional rustic styling is updated with a more pitched roof, material mixing, and a heavier use of metal, particularly at the roof, and in windows and doors, to contrast with wood features. Updated colonial homes maintain their historical proportions yet contrast them with asymmetrical elements by applying a new color palette and new materials, and by using less formal spaces in the interior. 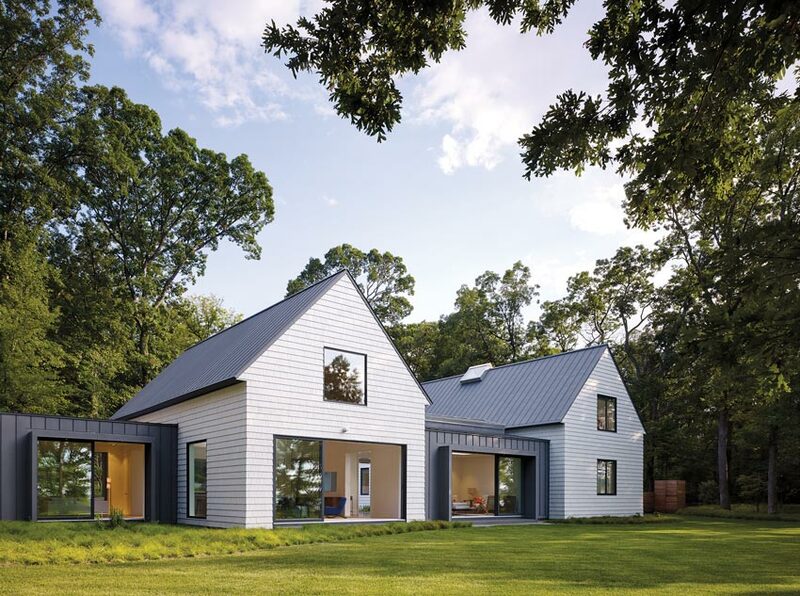 The modern shed and box home represent ultra-contemporary design, as they redefine a home’s footprint and embrace geometric profiles. Across the movement, an emphasis is placed on outdoor living and the use of the exterior of the home and its surroundings to create new living spaces. As traditional styles are reborn through contemporary design, they offer refined, clean lines. And importantly, each expression of contemporary design embraces the heavy incorporation of glass throughout the building. Doors and windows are front and center in a modern home. Windows and doors play a crucial role in modernizing a contemporary design, helping set the up-to-date home apart from its traditional counterpart. A contemporary craftsman stands out on the street because of its bold incorporation of windows along the front facade; an American farmhouse might feature a pivot entry door system greater than 6 feet wide and a multi-panel zero-post corner system. Contemporary designs are, at their core, glass centric. To modernize a fenestration package, narrow frames, stiles, and rails are necessary. In style, frame elements should be minimized, with square lines rather than traditional bevels. Hardware has undergone a similar reformation. Locks and handles are combined into a seamless, simplified, single system, removing unnecessary visual clutter from doors and windows. Door sills are completely recessed, avoiding the creation of a defining line between rooms or spaces. Contemporary design is also changing window framing materials. While all-aluminum windows and doors were once a budget-driven, lower-grade window, thin-frame, all-aluminum window and door packages with high- performance values are currently in demand to capture a more up-to-date feel in homes. Metal finishes, whether aluminum, clad, or anodized, dominate the current palette. Regardless of the framing material selected—wood, clad, or metal—thinner frames with simplified details define the trend. Unique window and door configurations, more commonly seen in commercial spaces are also embraced by contemporary design. Their translation from commercial into residential is changing the face of homes. 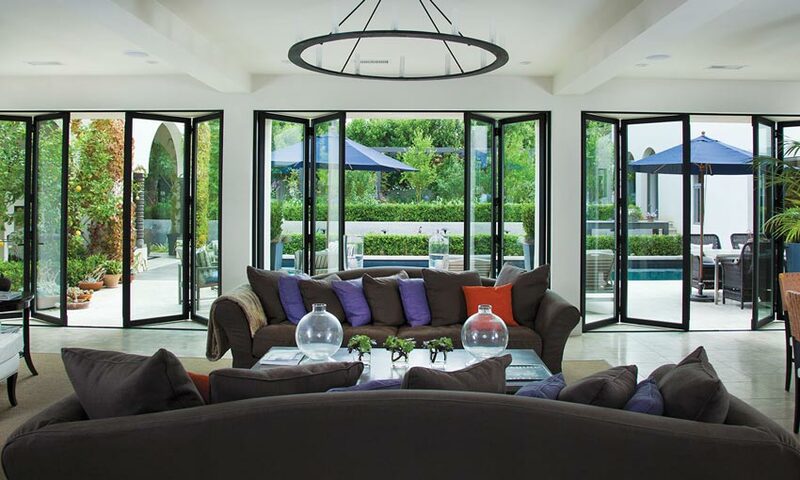 Massive multi-slide and folding door systems are a hallmark of the trend, but beyond this staple is also an increase for doors with zero post corners. Additionally, folding or multi-slide windows that combine directly into a multiple panel door system without a post are gaining in popularity. Kitchen servery windows that fold or slide into a recessed pocket are also current. Pictured is an aluminum wood multi-slide system with a stacked configuration with all panels to one side when fully opened.